How To Overcome Obstacles: 5 Ways On How To Be A Conquerer – Sig Nordal, Jr.
September 15, 2017 Sig Nordal, Jr.
To stress you out beyond your normal limits with extreme mental and physical challenges to make you worthy of serving with the world’s most elite fighting force. This is the simple principle of the US Navy SEALS. But, don’t confuse simple with easy. In order to be one the greatest warriors on the planet, you must conquer the obstacles in front of you. If you only endure, you will become just another failed statistic. During BUD/S training, the most iconic and demanding event is Hell Week. Candidates are put through extremely rigorous exercises for 5 days straight with less than a few total hours of sleep. Activities will include running, swimming, paddling, push-ups, sit-ups, rolling in the sand and log PT. Out of approximately 40,000 Navy recruits a year, only 250 (or less than 1%) actually possess the mental and physical toughness necessary to make it through Hell week and become a SEAL. It isn’t always the largest and strongest men or the fastest swimmers or runners that complete the training. It’s most often those who have the strongest will and a burning desire to not give up. Champions know that the only way to the finish line isn’t going around the obstacle but through it. And the same goes in the real world. Obstacles, struggles, and sufferings are inescapable and are very real in the human experience. The simulated harsh conditions of Navy SEAL training parallel the authentic harsh episodes of real life. Successful Navy SEAL candidates feed off of the intensity, employ mental toughness, resist the seeds of doubt and are relentless about finishing. And like the SEALS, in order to navigate through a real chapter of suffering, you must use obstacles as leverage instead of shackles holding you from success. In the depth of suffering, it is often the difference between conquering and enduring that determines the outcome of either breakthrough or breakdown. Enduring is passive, indifferent, weak and unintentional. Conquering is meticulous, purposeful and intentional. A champion’s mindset is all about conquering obstacles rather than simply enduring in hopes of making it through. So, how do you become a warrior? Here are 5 ways to be a conquerer and not an endurer. “If you’re going to play on the Tour, you have to love golf all the time,” he said. “It’s not going to work if you can only love it when everything’s going your way, every putt’s going in the hole, and every carom is bouncing into the fairway instead of out of bounds. It’s not going to work if you practice every day and only love it when the ball is going where you’re looking. You’ve got to love it when you practice day after day and you can’t find it. You’ve got to love it when every putt looks like it’s going in and then lips out. That’s what it’s about.” (How Champions Think, Bob Rotella). In the early hours of December 10th, 1914, an explosion shook the city of West Orange, NJ. Thomas Edison’s factory was immediately engulfed in flames. Despite the joint effort of several fire departments, the blaze was too powerful and decades of work was destroyed in a fiery instant. And how did Edison respond to this? 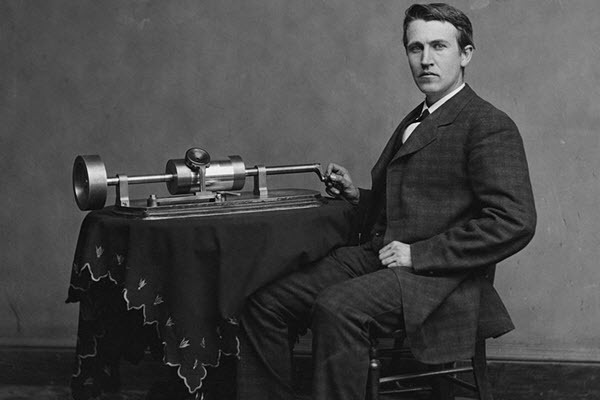 Even though Edison was almost 70 years old and a lifetime of work was destroyed in minutes, he told a New York Times reporter that he would start rebuilding the very next day…and that’s exactly what he did. He realized he had no control over the situation and chose to work with the given circumstance and not fight against it. It’s all about perspective. Edison’s perspective on the situation grounded him in the reality that there was absolutely nothing he could do at this time other than to rebuild. The damage was already done. How many times have you been in a situation, where a relatively-speaking, contextual thought should alter how you respond? If your internet is slow on your phone, at least you have a phone equipped with up-to-date 21st-century technology. If your clothes are wrinkled in the morning, at least you have nice clothes to wear, let alone a job to go to. And if you are late to work and behind a really slow driver, at least you won’t get cited for speeding. Viewing obstacles and struggles through the proverbial “could be worse” lens allows you to see the situation relative to someone who does not have your luxuries. It also sheds a sobering light on your life by grounding you in gratitude. It’s impossible to be angry and in a state of gratefulness at the same time. When the burden seems overwhelming or insurmountable, it is easy to give into the temptation of giving up. But the paralyzing situation you are in is almost, all the time, reducible to smaller parts. When you focus on tackling the fundamental elements of the situation, you can carve out a path to ultimate victory. Defeating the obstacle in front of you is always manageable if you just start somewhere and focus on one thing at a time. Today it may be the letter “A” and only the letter “A”. Tomorrow or even next week, it may be the letter “B”. We all want it to be over. But, saturating yourself in wishful thinking will cause you to never start the conquest or, even worse, cause you to fail to chisel your character and strengthen your essence. Every micro conflict of the whole is a teachable moment for you to learn and sharpen other areas of your life. Know there is always a way out. Be an overcomer. If your relationship is your identity, when it’s gone, so are you. If your job is your identity, when it’s gone, so are you. And if your identity or self-worth is wrapped up in something outside of your own existence or purpose, then you too will perish when those things fail. Suffering is non-discriminant that it does not care how you came to meet it. There isn’t a more conservative version of suffering. If you want to win the war on suffering, you must first see yourself as an ascendant being with an independent meaning, where everything in your life is your responsibility. If you approach your suffering knowing that you are an overcomer, you will overcome. It’s all about winning in your mind first and then taking action. As you fight, never forget who you are…an overcomer and nothing less than that. Here is a way to illustrate the point. With boiling water, you can create steam. With pressurized steam, you can power engines and turbines through mechanical work. This was part of a composite of revolutionary ideas that literally changed the landscape of our human experience. But, in order for water to turn to steam, it has to reach the exact temperature of 212 degrees. If 212 degrees is not achieved, then there is no high-pressurized steam, no mechanical work, no engine or turbine turning. In essence, there’ll be no Transcontinental Railroad or electricity to power millions of homes. 211 degrees, a simple 1-degree cooler, is really hot, but it won’t bring water to a boil. The same is true of your identity. If you identify as an overcomer and nothing less, then you are an overcomer. This must be nonnegotiable. You must be relentless in this identity. Any moments of weakness will result in you crumbling and submitting to the obstacle in your life. The overcomer never taps out because they know there is always a way out. What if this thing that keeps you up at night affects how you interact with people, sustains your stress level and negatively influences your self-worth, is actually critical in strengthening you? When meaning and purpose is found in one’s suffering, the conditions in which the struggle occurs are mutated in your favor. Instead of being held hostage by this ominous scenario, you ransom the situation for a net gain of self-betterment. You’re already suffering, you might as well get something out of it. Nobody illustrates the need to find meaning in suffering better than Viktor Frankl. As a Holocaust survivor and world-renowned psychiatrist, it was a defined purpose and meaning-through-suffering that literally kept him alive among the prisoners around him who surrendered to the call of death. This is the most important part of the message. If you don’t get anything out of this post, at least marinate on this thought. You must not lose hope or courage. Fight through the struggle like somebody else’s life depends on it. Somewhere, a spouse, child, relative or someone you don’t personally know is counting on you. It’s not enough to endure the situation; some very important people in your life depend on you conquering it. That’s where you start learning how to overcome obstacles. Just like the mission of the US Navy SEALS who are responsible for carrying out the most dangerous operations for the welfare of others, you are responsible for sustaining and providing positive living conditions for others, too. The post How To Overcome Obstacles: 5 Ways On How To Be A Conquerer appeared first on Dumb Little Man.